What Day Of The Week Is June 17? 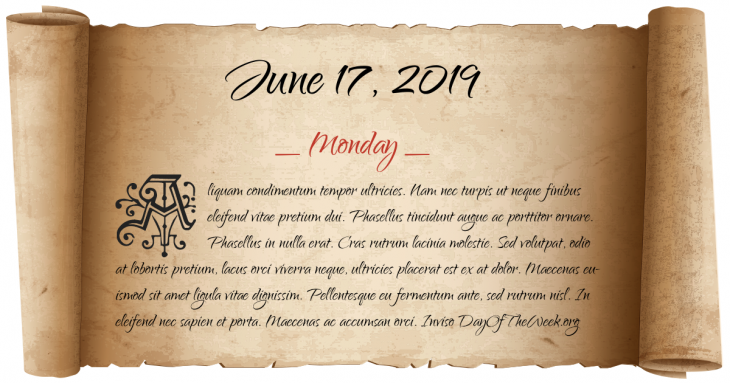 June 17, 2019 is the 168th day of the year 2019 in the Gregorian calendar. There are 197 days remaining until the end of the year. The day of the week is Monday. Indian Wars: Battle of the Rosebud – 1,500 Sioux and Cheyenne led by Crazy Horse beat back General George Crook’s forces at Rosebud Creek in Montana Territory. Indian Wars: Battle of White Bird Canyon – the Nez Perce defeat the U.S. Cavalry at White Bird Canyon in the Idaho Territory. Apartheid: the South African Parliament repeals the Population Registration Act which required racial classification of all South Africans at birth. A “joint understanding” agreement on arms reduction is signed by U.S. President George Bush and Russian President Boris Yeltsin (this would be later codified in START II). Who were born on June 17?